With growing demand for housing and a limited supply, prices are rising considerably in the past two years for both owning and renting. Below is an update of our office’s standard price to rent ratio that uses the FHFA home price index and the Owner’s Equivalent Rent from the consumer price index data (per SF Fed methodology). This data show that in the past two years (late 2011 – late 2013) home prices in Portland rose 12.4 percent and rental inflation increased 7.1 percent. This results in a rising price to rent ratio (indicating that buying is becoming more expensive relative to renting). 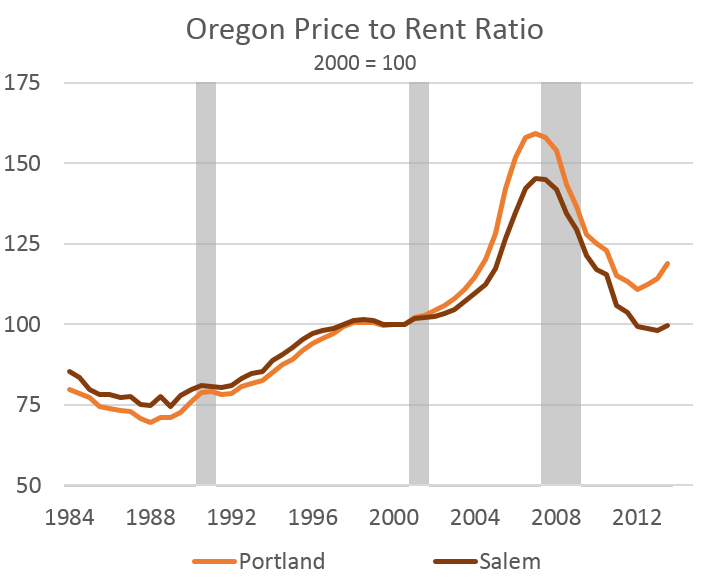 Salem home prices rose 3.2 percent based on the same data, and has a more stable price to rent ratio in recent years. The home prices and rental inflation factor used above are trying to gauge the overall price movements of the housing stock and it does a pretty good job of that. However, one interesting item of recent research has been to try and focus on the current market prices of what it takes to buy or rent today. Instead of average rents or prices over the entire housing market, examine just what it takes to find a place to live in today’s market. For new owners/renters/movers, are purchase prices rising faster than rents, or vice versus? Luckily here in Oregon we have the great Multifamily NW apartment reports with rental price per square foot data, which is a fabulous resource and one I have been trying to find a way exploit more. 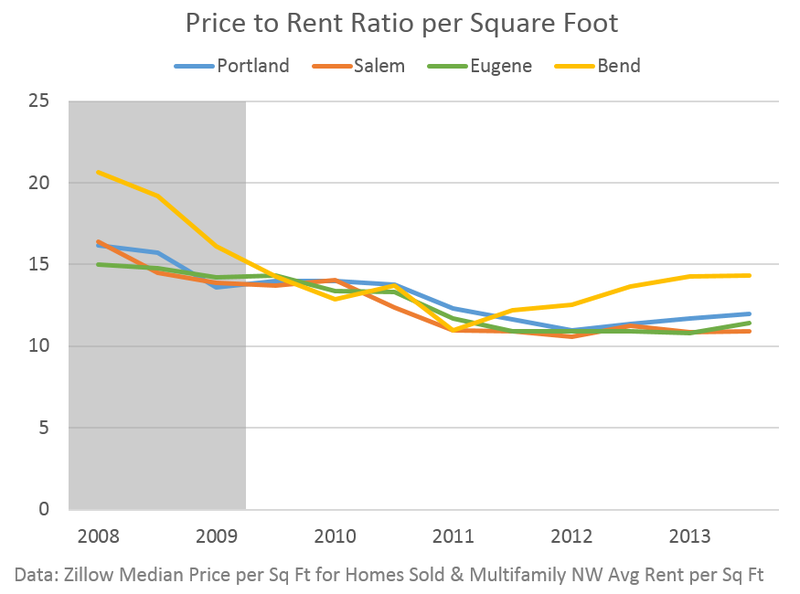 It also includes data for more than just Portland so matching the rental price data with the recently sold home price data from Zillow, we can create price to rent ratios for Salem, Eugene and Bend as well. This measures price changes on a per square foot basis. One can do the same analysis but with just Zillow data, however their rental data only begins at the end of 2010 so there is not as much history. Examining the housing market in terms of what it takes to find a place to live today, it shows a much more stable relationship between buying and renting. Although both are rising very fast, they are more or less moving in tandem. On the outlook, our office is still looking at moderated price increases as eventually a supply response will come (more on this soon). Permitting for new apartment construction is up considerably post recession and I think the headline from the latest Barry Apartment newsletter out of Portland says it all: “Construction Ramps Up As Developers Play Catch Up.” At the least it appears there is no longer acceleration in price increases, even though they are still going strong. Next week the Spring 2014 Multifamily NW apartment report will be released and we can see just how strongly rents increased in early 2014, as we know home prices continued upward. Future work will include exploiting the neighborhood level rental price data for Portland, as Zillow homes sold data is available as well.